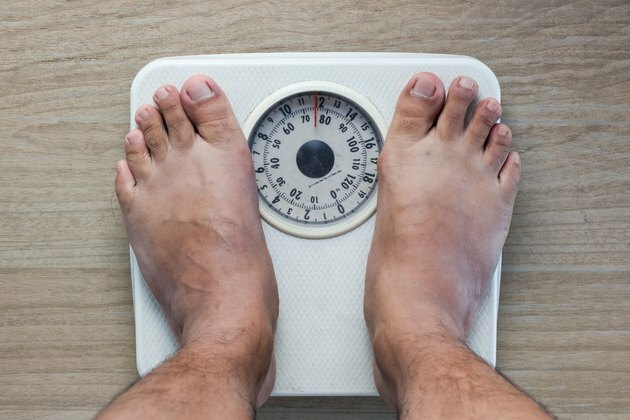 Losing 20 pounds can make a serious difference in your health -- if you're overweight, it may be enough to lower your risk of chronic weight-related diseases, like heart disease. It'll also affect how you look. And while it's natural to want rapid results, don't expect to lose 20 pounds in just a couple weeks. Depending on your weight, gender and activity level, a 20-pound weight loss could take between 10 and 20 weeks, or even longer. In general, safe weight loss comes at a rate of up to 1 to 2 pounds per week. That involves reducing your calorie intake to 500 to 1,000 calories less than you burn every day -- enough to burn an extra 3,500 to 7,000 calories each week, or the equivalent of 1 to 2 pounds of fat. Exactly how much you lose depends on a few factors, though, including how much time you'll be able to devote to activity, how well you control your diet and how many calories you burn now. If you're younger, male and live an active lifestyle, you naturally burn a relatively large amount of calories throughout the day. So you can more easily cut 1,000 calories to lose 2 pounds each week and achieve your 20-pound weight loss in about 10 weeks. If you're older, female and live a sedentary lifestyle, though, your daily calorie needs are probably lower. If that's the case, you'd want to cut a smaller number of calories -- say, 250 to 500 calories -- and lose 0.5 to 1 pound a week. At that rate, you'd reach your goal in 20 to 40 weeks. Plug your weight, age, height, gender and activity level in an online calorie needs calculator -- like the one from the Baylor College of Medicine -- then choose how many calories you want to cut for weight loss. Just ensure you're meeting the minimum calorie needs -- 1,800 for men and 1,200 for women -- to stay healthy as you lose weight. While you might not want to wait a few months to lose 20 pounds, taking it slow will help you stay slim in the long run. Meeting your minimum calorie needs and sticking to a slow-but-steady weight-loss plan helps make sure that most of each pound you lose actually comes from fat. If you cut calories too much -- or starve yourself to lose weight -- you'll start losing muscle as well as fat. So while you'll still see a difference on the scale, and reach a 20-pound loss more quickly, you'll also stall your metabolism. That means you'll need to diet more and more to keep losing weight -- or keep the weight off -- since you'll naturally burn fewer calories throughout the day. Losing muscle also means you're more likely to look "flabby" when you reach your goal -- instead of fit, healthy and toned. Don't worry if your weight fluctuates a little on your 20-pound weight-loss journey -- your body doesn't always lose a pound or two a week like clockwork, and it's normal to experience some highs and lows as you lose weight. You'll likely notice faster-than-expected weight loss as your body adjusts to your new diet. On the other hand, you might lose more weight than expected one week and not lose any weight the next. Don't get discouraged -- try recording your weight a few times a week and taking an average, and use your weight over the past several weeks to assess your weight loss. It's also normal to go through a "plateau" -- a few weeks where you don't lose weight. When that happens, recalculate your calorie needs, taking into account your new, lighter, body weight. Shake up your routine by taking in a new exercise class, trying a new cardio machine or testing out new healthy recipes -- that might "shock" your body back into losing weight. The 10 to 40 weeks it will likely take to lose 20 pounds are just the beginning of your weight-loss journey -- once you've hit your goal weight, you'll need to stick to a healthy lifestyle to keep it off. You'll need fewer calories to maintain your new, trimmer figure than you did before the weight loss, so use the adult energy calculator to figure out how much food you need each day. Staying active also keeps you slim, as well as boosts your mood, promotes good cardiovascular health and lowers your risk of osteoporosis. Schedule at least 75 minutes of vigorous-intensity cardiovascular exercise or 150 minutes of moderate-intensity exercise -- or a combination of the two -- to maintain your weight, recommends the Centers for Disease Control and Prevention.